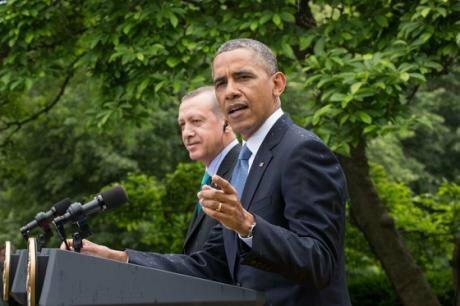 President Barack Obama and Turkish Prime Minister Recep Tayyip Erdoğan hold a press conference in the Rose Garden of the White House, 2013. Wikicommons/Chuck Kennedy. Some rights reserved. In 2009, Obama’s first trip as president to a Muslim country was to Turkey. Washington kept talking about a “Turkish model” of Islamist democracy with huge potential for setting up an example for the Middle East. After six years of despotic rule, Turkey is now far from being a model for anything but a mélange of foreign policy failures, a hub of perpetual domestic unrest and ever-diminishing respect for its human rights record. One would think this kind of deterioration would jeopardize Turkey’s EU bid. Disregarding European norms and values should have caused several blocks for Ankara’s road to EU, in theory. However, it’s more than obvious that Europe is desperate to make a deal to turn off the flood of migrants, and almost ready to sign off anything to make it happen. Meanwhile, human rights abuses occur every day. These days, the name of the game is “insulting the president” and the last victim of that is Barış İnce, former editor of the leftist daily Birgün. İnce is sentenced to 21 months in prison while the newspaper Birgün is trying to deal with around 40 investigations. Pressure on the freedom of the press has been going on for so long that is basically normalized. Turkey’s record for the last 12 months is quite enough to raise alarms on press freedom. Many foreign journalists deported for different reasons, most commonly for aiding the PKK, including Mahir Zeynalov from Azerbaijan, Der Spiegel photojournalist Andy Spyra, Claus Blok Thomsen from Danish Politiken, Dutch Freelance journalist Frederike Geerdink, Jake Hanrahan and Philip Pendlebury from Vice News. These developments surprised no one, as Turkish authorities continued their witch-hunt by jailing two leading journalists, Can Dündar and Erdem Gül, for exposing state secrets and aiding a terrorist group; raiding the weekly newsmagazine Nokta for its cover, opening a case against Hurriyet’s editor-in-chief Sedat Ergin once again for insulting the president, while appointing state-trustees to the Koza İpek Media Group, Zaman newspaper and Cihan News Agency. This campaign of intimidation has become common practice in Turkey and still President Erdogan is more than confident that he can strike a favorable deal with the EU. Paralyzed by the migration crisis, Europe is disregarding every kind of criticism and advice coming from all spheres. These include worrisome remarks from Human Rights Watch, the Committee to Protect Journalists, UN and the Council of Europe. And still, the EU is turning a deaf ear to these warnings. In fact, German Interior Minister, Thomas de Maiziere, went so far as to say that they, “should not referee the subject of human rights for the entire planet”. It’s no coincidence that the timing for the seizure of opposition media groups overlaps with the refugee crisis. The Turkish government is keenly aware that it has the upper hand and plays it well both domestically and overseas. Erdogan is depicting Turkey as the potential savior of Europe’s migration crisis confident that a hypocritical EU will ignore the country’s media crackdown. It seems it is easier to walk hand in hand for a diverse and independent media in front of the cameras, as after the Charlie Hebdo attacks, than to take real action. Now Europe needs to show that it actually cares about the cornerstones of democracy by putting pressure on Ankara to restore the free flow of information and ideas. With a worrying economy, terrible human rights record and constant civil unrest, Turkey is nowhere near providing a safety net for Europe, and the EU’s eyes wide shut won’t make these go away.